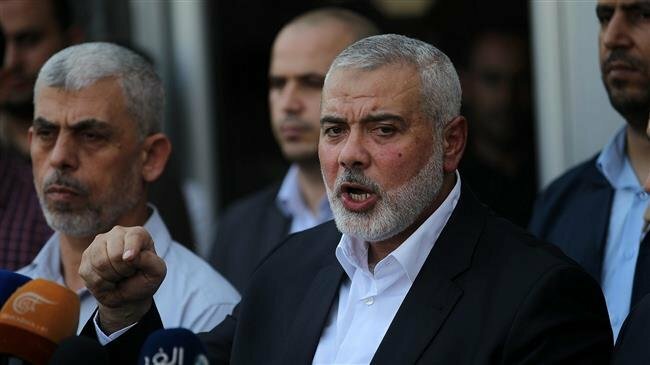 The leader of the Palestinian resistance movement of Hamas, Ismail Haniyeh, says the weekly anti-Israel rallies will continue as long as the Gaza Strip remains under siege. Haniyeh said on Saturday that Palestinians will not stop the Great March of Return protests until a decade-long Israeli blockade on Gaza is lifted completely. He was speaking at a funeral of Palestinians who were killed by Israeli forces along the border fence between the besieged Gaza Strip and the occupied territories a day earlier. Palestinian mourners across the Gaza Strip held funerals for seven protesters killed by Israeli forces during the weekly rallies on Friday. Elsewhere in Khan Younis and at Nuseirat refugee camp in central Gaza, hundreds of people held funeral ceremonies for Ahmad al-Tawil as well as 17-year-old Ahmed Abu Naim who lost their lives during anti-occupation rallies east of al-Bureij refugee camp on Friday. Gaza health officials said seven Palestinians were killed and 140 people wounded by Israeli forces during weekly protests on Friday. Around 200 Palestinians have so far been killed and over 20,000 others wounded in the renewed Gaza clashes, according to the latest figures released by the Gaza Health Ministry.